All I have of this big storm are memories. Oft repeated ones, my daughter claims. I have lived here in the Valley all my life except for the parts of the years I went to school at Texas A&I in Kingsville for my bachelor’s degree in elementary education and my master’s in elementary ed at Baylor in Waco. Teaching school in Brownsville at the time of the storm gave me a chance to visit with those who lived there, and those who came there for aid. We knew ahead of time that a storm was coming, but what is so unusual about wind here? We debated about leaving – but my husband’s job would demand he be there after the storm. So I cooked a big batch of pinto beans (filling and keep pretty well without refrigerating) and made up a huge batch of biscuits with the idea of feeding my family and any who needed it. We stayed in place until about midnight when the radio gave more news and my husband decided it would be better for us to go. We quickly loaded our family and cocker spaniel dog and supplies in the family station wagon. The wind was blowing the rain in the dark, dark. My husband did an excellent job in getting us a place in the steady line of cars leaving. Some cars fell out along the way – we decided against stopping to help because of the weather. We stayed on the main road up to Mission where my aunt and uncle knew we would come if needed. The welcomed us as much as they could and we bedded down on the floor and tried to get the kids to calm down. All their lovely windows and double doors rattled and intensified the sound of the rain and wind. Small limbs of the trees by the street broke and fell against the house. The electric wire along the alley broke and provided sparks as it danced outside. That meant no more lights in the house. The biggest crash was the huge tree not too far from the house becoming uprooted and falling on the back of the house. It went completely through the roof letting wind and rain in the house. Allen went out to the car and got tarps and nails and hammers to sort of seal off that part of the house. It helped make us more comfortable. My aunt and uncle were very upset with the damage to their house. The weather continued with the “break” that comes. Even our dog could take care of business with going outside. We cleared away as much as we could off the car and brought in food and water before it began again in earnest. By now we were tired and yet alert. Next morning early, we headed home. The road was not crowded but had some also going home. At times the water was over the fenders and we were afraid the engine would not keep going. The next worry was that our gas gauge showed empty long before we could see the station at the edge of town. We all had our “walk” orders if that became necessary. The stations needed electricity to pump gas, so even if we made it to the station, we were not sure we could get gas. Fortunately, they were still in business, and we did get gas. What a sight on the way to our house! Our street was clear of water almost. Lots of trees down, and we had turned off water, electricity and gas before we left. But it was dry. We all enjoyed dry clothes before a loud speaker came down the street telling us to get out. 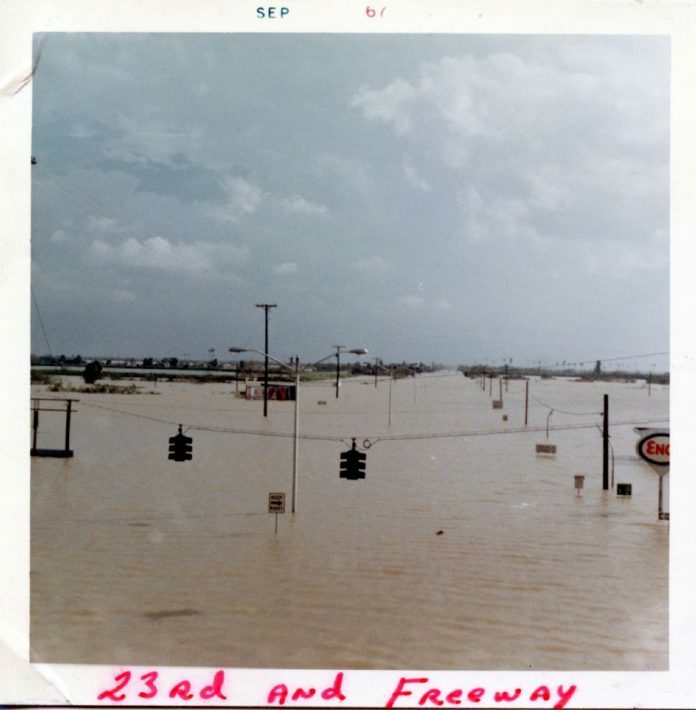 The levee had broken; the pump for the Resaca by us was not working so it would be flooding. We put up everything in the house we could. If we were not tired enough, we were now. The car had to be put in a dry spot. I got out clothes enough for a week and put them in a pile. I carried them on top of my head with water over my shoulders to Boca Chica that was high and dry. We went to a friend’s house to stay – I was able to teach the whole week – serving pimento sandwiches to those without after school each day in the school cafeteria for the Red Cross. Cleanup was quite a job. With the humidity here, mold and mildew seemed to take over easily. We tried to help everyone we could – there seemed to be no end to problems. Some fun, too. We got out our camp stove (a propane two-burner) and cooked up everything in our freezer for a neighborhood cookout – just bring your drink and plate and spoon. Was a lot of fun before back to reality.